Stan puts together a 'bucket list' for his ultimate loudspeaker. Newcomers MBA adopts a modular approach to its metal-cabinet loudspeakers. Can a headphone amplifier really be worth £5,000? Jose Victor Henriques bought his! 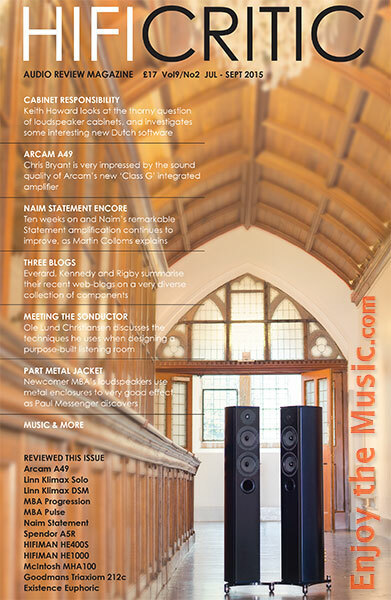 Keith Howard investigates loudspeaker enclosures, and tries some new Dutch software for analysing problems. Paul Messenger wall-mounts a fifty year old 12-incher. Martin Colloms tries out a compact sealed box floorstander. This Finnish speaker combines dreamy woodwork with a single full-range driver. Ten weeks after switch-on, Naim's Statement amplifier continues to improve. Arcam's John Dawson talks to Chris Frankland. Changing a capacitor has substantially improved this DAC. 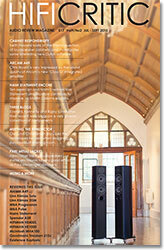 Jason Kennedy tries out Linn's top-of-the-line Klimax DSM and Solo components. Steve Harris meets listening room specialist Ole Lund Christiansen. Paul Messenger is seduced by a Japanese cartridge with a bamboo cantilever. These planar headphones from China set a very high standard indeed. Chris Bryant is very impressed by Arcam's new Class G integrated amplifier. Andrew Everard muses on copyright issues, Astell & Kern's AK Jr, and a Gramofon. Paul Rigby – a.k.a. The Audiophile Man – gets serious over mono LP playback and tip sizes. JK discusses the Czech Remton phono stage, and Ken Ishiwata's Eindhoven listening room. A planar headphone that really delivers the goods, and at a budget price to boot. Arcam's irDAC can handle numerous digital sources, and Sonority Design's unique isolation platforms. Naim has updated its streamer software, but has this also upgraded the sound? Greg Drygala's Jazz reviews tend to focus mainly on the ACT Music label this time. Colin Anderson picks a new selection of recent classical recordings. Nigel Finn from the Chord Company reviews six recent rock and folk releases. The significant role played by loudspeaker enclosures looms large in this HIFICRITIC.